UNIQUE T3 BULB OPTIONS	* No Bulb	 1 ea. T3-G4 1 Watt 3000K (+$25.00)	, .2lb	 1 ea. T3-G4 2 Watt 3000K (+$27.00)	, .2lb	 NO BULBS - lighting fixtures ship without bulbs unless one is selected here. The Envoy offers soft level lighting with an elegant look. The frosted lens minimizes glare while the 20 Watt Astro-Brite lamp provides sufficient light to cast soft glows on any area. Ideal for ceilings or overhangs this fixture is perfect for above outside barbecues or seating and outside entertaining areas. These fixtures bring lighting to the next level without forcing you to use a bullet down light for softer down-lighting applications. Crafted from cast and machined brass. Crafted from brass. Unibody design provides enclosed, water-proof wireway. High temperature, silicone o-ring provides water-tight seal. 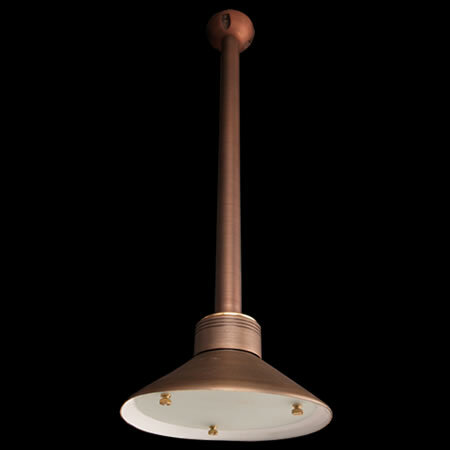 Solid brass stamped shade with reflective white powder coat interior. For use with a Xelogen Astro-Brite lamp up to 20W. FLEX™ Series LED lamps are available in 1W or 2W T3 lamps. LED lamps are available in 3000K color temperatures. Cast brass sphere base included.